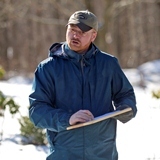 Home » People » Faculty » Harper, Richard W.
As Extension faculty, my position involves initiating & expanding a broad-based integrated research & extension program in support of the management of municipal forests & urban landscapes. I administer the award-winning ‘Urban Forestry Today‘ monthly webcasts, designed to meet real-time educational needs of practitioners & I closely align outreach-programming efforts with cooperating associations & agencies. I regularly contribute to newsletters (ISA New England Chapter Newsletter; MA DCR Citizen Forester) read by professionals & tree enthusiasts across Massachusetts & New England. Dampier, J.E., R.W. Harper, A. McElhinney and E. Biltonen. 2018. Modeling benefit–cost analysis of hemlock woolly adelgid host plant resistance with emphasis on least-toxic chemical treatment alternatives. HortTechnology 28(5): 624-628. Harper, R.W., E.S. Huff, D.V. Bloniarz, S. DeStefano and C.R. Nicolson. 2018. Exploring the characteristics of successful volunteer-led urban forest tree committees in Massachusetts. Urban Forestry and Urban Greening 34: 311-317. Bocsi, T.J., P.S. Warren, R.W. Harper and S. DeStefano. 2018. Wildlife Habitat Management on College and University Campuses. Cities and the Environment (CATE) 11(1): 1-14. Harper, R.W., D.V. Bloniarz, S. DeStefano, C.R. Nicolson. 2017. Urban forest management in New England: Towards a contemporary understanding of tree wardens in Massachusetts communities. Arboricultural Journal 41(3): 1-19. Scharenbroch, B.C., D. Carter, M. Bialecki, R. Fahey, L. Scheberl, M. Catania, L.A. Roman, N.L. Bassuk, R.W. Harper, L. Werner, A. Siewert, S. Miller, L. Hutyra and S. Raciti. 2017. A rapid urban site index for assessing the quality of street tree planting sites. Urban Forestry and Urban Greening 27: 279-286. Yin, J., R.W. Harper and N.L. Bassuk. 2017. Effects of Tree Production Method and Transplanting on Root Hydraulic Conductance. Journal of Environmental Horticulture 35(2): 79-83. Allen, K.S., R.W. Harper, A. Bayer and N.J. Brazee. 2017. Nursery production systems and their impact on urban tree survival. Urban Forestry and Urban Greening 21(1): 183-191. Harper, R.W. and P.A. Weston. 2016. Potential of alternative Tsuga spp. as landscape replacements for T. canadensis: Longer-term evaluation and propagation of T. chinensis. Arboriculture & Urban Forestry 42(5): 346-354. Harper, R.W., W.R. Autio, J.T. Finn and F.S. Rossi. 2016. Tree Wardens and public grounds management in North America: Overseeding athletic fields with perennial ryegrass to promote safe playing surface. Arboricultural Journal 40(3): 1-13. Markarian, G., R.W. Harper and D.V. Bloniarz. 2016. Flexible, open-source programmes and estimating projections of urban tree benefits: A case study in Amherst, MA. Arboricultural Journal 38(1): 1-13. Green, B.L., R.W. Harper and D.A. Lass. 2015. Differing nursery production systems impact cost of planting oak species in the urban environment. Horttechnology 25(5): 651-656. Dampier, J.E.E., R.W. Harper, L. Schwartzberg and R.H. Lemelin. 2015. A comparison of arborists’ and horticulturists’ preferences of Tsuga chinensis to T. canadensis in the urban landscape. Arboriculture & Urban Forestry 41(1): 41-48. Clapp, J.C., H. D.P.Ryan III, R.W. Harper and D.V. Bloniarz. 2014. Rationale for the increased use of conifers as functional green infrastructure. Arboricultural Journal 36(3): 161-178. Harper, R.W. and R.S. Cowles. 2013. Susceptibility of Chinese hemlock (Tsuga chinensis) to injury from autumn horticultural oil applications. Arboriculture & Urban Forestry 39(1): 6-10. Weston, P.A. and R.W. Harper. 2009. Potential of Tsuga spp. from North America and Asia as replacements for eastern hemlock (Tsuga canadensis). Arboriculture & Urban Forestry 35(1): 5-9. Harper, R.W. 2016. Tree of merit. City Trees: The Journal of the Society of Municipal Arborists (Issues I-IV). Harper, R.W. 2013. Urban forestry on the frontier. City Trees: The Journal of the Society of Municipal Arborists 49(5):10-14. Harper, R.W. 2018. Review of Hemlock: A forest giant on the edge, By D. R. Foster. Journal of Forestry 116(1): 88-89. Harper, R.W. 2017. Review of The illustrated encyclopedia of trees (2nd ed), by D. Moore and J.W. White. Arboriculture & Urban Forestry 42(3): 83-85. Harper, R.W. 2016. Review of Features from the past for the future, Branching Out: An integrated pest management newsletter for trees and shrubs, by D.D. O’Brien and G.W. Hudler. Arboriculture & Urban Forestry 42(3): 213-214. Harper, R.W. 2015. Review of The abc’s field guide to young and small tree pruning by A.G. Pleninger and C.J. Luley. Arboriculture & Urban Forestry 41(1): 49-50. Harper, R.W. 2014. Review of Wasp and bee management: a common-sense approach, by J.L. Gangloff-Kaufmann. Arboriculture & Urban Forestry 40(1): 46-47.